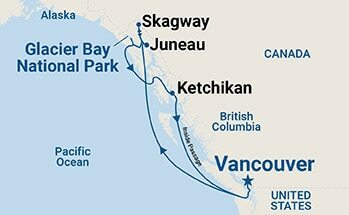 We invite you to experience an Alaska cruise vacation as only Princess can show you. We offer a range of enriching Alaska cruise vacation options to see the Great Land’s glaciers, wildlife and national parks from the perspective of spectacular ships, exclusive rail service and Princess Wilderness Lodges. With both roundtrip and one-way Alaska cruises you can experience stunning views of glaciers, explore beautiful port cities and trek through Alaska’s untamed beauty. Come find yourself in the heart of the wilderness and discover the very best of Alaska with Princess. *September 18 only: Book by Apr 30: Exclusive $250-$350 USD per cabin on board credit! New Bookings Only. Limited space available. Promotion may be withdrawn at anytime. Map illustration may contain port order and/or port substitutions, please review itinerary listing for actual list of ports. Port arrival and departure times are approximate and subject to change without notice. Experience VANCOUVER Pre/Post Cruise. With just a couple of days in Vancouver before an Alaska sailing, cruisers can still enjoy an authentic taste of the city. This itinerary takes you from exploring historic neighbourhoods and meeting the locals over a cocktail, to venturing high into the mountains. To book the activities, please click on the links (in bold) listed on the pdf. Travel Best Bets will be happy to book your Vancouver accommodation for you.